Over the last couple of years I have seen my fair share of critics that post negative commentary about Lifestreaming. I feel that this is due to a narrow-minded view of what it is. This in part is due to the misconception that Lifestreaming is only about personal narcissm and vanity. Sure, that’s a part of it, but it goes far beyond that. There is so much negativity centered around the all too common stereotypes perpetuated by people who continually tweet about eating a sandwich. This alone has provided much of the cannon fodder for many to quip about the uselessness of Lifestraming. That behavior prompts many to state why the hell would would they want to follow any normal person’s life. Well I find most “normal” people I follow to be far more interesting than most celebrities that put their life on display nowadays, but that’s a different post. In the sandwich example, there are many ways to add pizazz to that tweet such as incorporating external services that add context. If more folks did this, then it might help remove that negative stereotype but unfortunately I don’t think that lame tweet poster boy is going anywhere anytime soon. The bottom line is many will continue this behavior and…that’s ok. But providing personal details about our lives is only one aspect of a well balanced Lifestream. Sure it’s nice to provide that insight for others to learn more about us as a person, but there is so much other content and value that we can provide in our Lifesteams. For most of the people who’s Lifestreams I follow, gaining insight from their personal posts is only part of the value. The other half of the equation is from all the content they highlight for me. So it’s the collection of the best content out there being curated by my social graph that provides value for me. So if we utilize these tools to share what we find and like as well as what we create, our Lifestreams become much more powerful. Over time as we find the people who share the same topics and interests as we do, we build an amazingly powerful content network. That is the other half of what make Lifestreams so powerful that many fail to understand. Robert Scoble wrote an interesting post recently that discusses the need to find better tools to allow us to curate our own Lifestreams. He states that we need to make it easier for people to incorporate photos, videos, audio to help tell our stories. I agree. There are currently several ways to Lifestream using services and platforms I cover here but for the most part it requires some knowledge and work. We haven’t quite lowered the bar far enough to penetrate the mainstream yet. Facebook is probably the simplest one stop shop at this point and finding a way to keep things simple and integrated like them would be the goal. But I also see a 3rd option in the functionality of curation that I would also like to see. An automated method to provide curated content across my various services that is built using my social graph (or followers on each of those services) If I could also tweak the dials to optimize it as well that would be even better. For instance it would be something like the FriendFeed best of day except more intelligent. For instance it could aggregate all the links sent out by my Twitter followers on a daily basis prioritized in descending order by how many of them tweeted the link and then perhaps even take it a step further by categorizing them by types of links. (e.g. blog post, video, photo) and perhaps even broken down by category. The smart algorithms to curate content to help me filter and digest information from the firehose intelligently and help me not miss things is the main thing I’m looking for nowadays. Writing about this subject has been simmering within me for quite some time. It was this post by Justin Clark which finally triggered the inspiration for me to finally write about this. 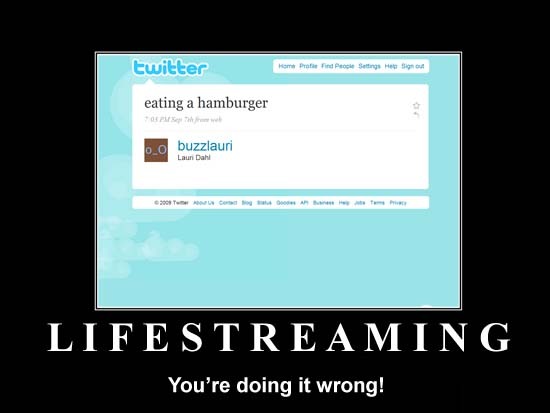 Lifestreaming is a trend that is only beginning to catch on. The potential of lifestreaming is huge. The problem is that most people have a tainted view of what lifestreaming is. The common perception is that lifestreaming is just a bunch of pictures, text and video broadcasting a person’s day to day life online; while it can be used like that, you’d better have a pretty interesting life if you want anyone to visit your site. A lifestream can be so much more. A lifestream should be a collection of thoughts, ideas, opinions and more published online utilizing various media formats. The more people use online services like Posterous and Tumblr this way, the more valuable content will be available on the web. People will be more likely so post short thoughts and opinions that normal blogs would not be able/willing to post. Lifestreaming adds a whole new level of value to the internet. I hope more people will use and embrace it. I have a feeling that Justin is going to be a great Lifestreamer. Previously to reading Justin’s post I had come across this post by Amy Mengel titled “Why are we all screaming for Lifestreaming“. She was asking how does Lifestreaming fit in between a blog and Twitter. This sparked a good conversation in the comments. While reading them I still continued to see the negative stereotypes that I read in so many other places, but the conversation was engaging. I decided to chime in on the conversation and bring my thoughts in. So I just covered on some of the value I get from other’s Lifestreams but for some that may not be enough of an incentive to create one on their own. Well there are plenty of other reasons to create a Lifestream as well and I’m sure plenty more to come. I think it will continue to take time both for more people to begin Lifestreaming as well as people understanding the value of it. Ultimately it will fall upon tools that make it easier to do and add value as well as evangelists banging the drum for it to continue to make its way into more people’s lives. Pingback: Dario Salvelli’s Blog » Blog Archive » Che valore ha il Lifestreaming? Nice post Mark. I would add that lifestreaming is also a record for oneself. A rather imperfect one at the moment as most of these tools don't have great search. interesting post, now I'm wondering why don't I see more posts on lifestreaming, workstreaming, etc? It's because the crappy pic you add with you cellphone will look like garbage, the map doesn't help anyone, and the whole post will be exactly as boring as the “lifestreaming” reputation. And those who say they do care, matter exactly as much as the 10M Diggs that were given out last year. Do you remember those diggs? Seriously, do you? 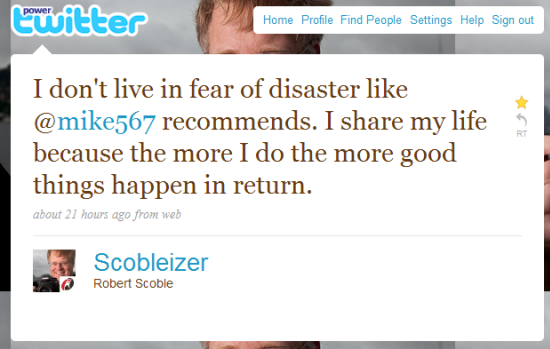 And Robert Scoble should be careful about wanting things “curated”. Or he should chose another word that matches his intents. if the web were “curated” Robert wouldn't have a seat at the table. There are lots of authors who sold many novels who aren't in the canon. Thomas Kincade is insanely popular, but doesn't show up in many museums. There are a few tricks to incorporating search with regards to Lifestreaming. 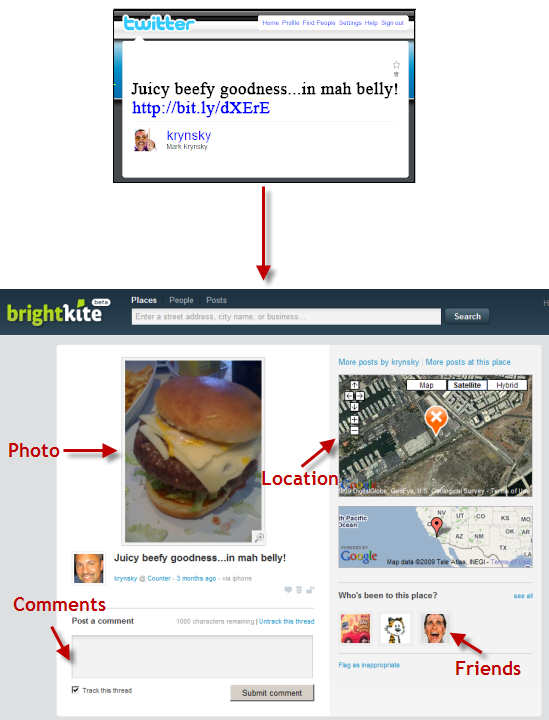 If you use FriendFeed then you will have a very nice search engine available to you. Another options is to add your Lifestream feeds to Google Reader which would also afford their search. Lastly, using the WordPress Lifetream plugin you could then use the built in WordPress search to find data. I have to disagree. I find value in friends that share links to useful tools that can help me with work or expose me to new music, books, restaurants, etc. Hell I even enjoy when they send me funny links to incendiary comments on blog posts written by trolls.